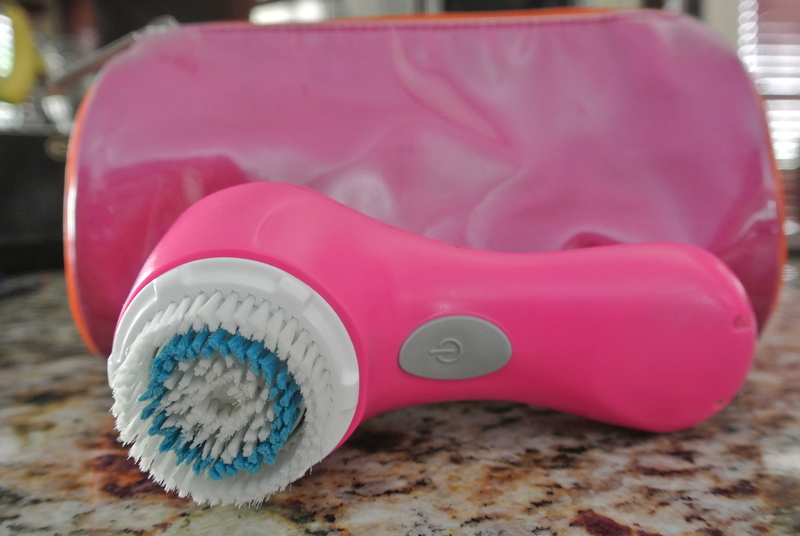 The Clarisonic Mia (can be found at Nordstrom) is the perfect compact skin cleansing system. It’s the convenient travel-friendly sized version of the original Clarisonic. It will change your life. Embarrassing as it is, at 30 years old, I suffer from occasional breakouts. Truth be told, I have tried everything under the sun to prevent this travesty. I blame it partly on hormones (<<–pretty sure they need to simmer) and majority on my freakishly sensitive skin. Blah! Needless to say, I’m a little cray about keeping my peachy clean complexion. This magic little machine not only has cleared my skin, but has actually made it softer and improved the texture when I added it to my current skincare regimen. After 3 months of consistent Clarisonic use. I have a tinted moisturizer on with a light, mineralized powder dusted on top. Oh, and blush of course. 😉 No foundation and no filter. It should be added to your daily skincare regimen to promote smoother feeling and looking skin. It will not strip your skin and is recommended by leading dermatologists, cosmetic surgeons, and Loveleigh Beauty’s very own skincare expert, Janee. Be sure to pay close attention to your skins needs though. I use Tazorac (a retinoid) and sometimes I will refain from using my Clarinsonic Mia everyday if my skin feels extra sensitive. Sometimes I may skip a day, it depends. DO NOT over exfoliate. Ever. Find your skins balance. There are different bristle heads to choose from. I use the the sensitive skin bristles and I make sure to change them out every 3 months. It’s imperative you change them to avoid germs. Let’s face it, germs are everywhere and the last place we need them is on our face. Ew. I’m obsessed with Torrey Pines Dermatology Fortified Exfoliation Scrub. It delivers a soothing wave of cleansing heat[<<literally, like a heat wave] as it gently removes dead, dry skin cells, excess oil, and residue to reveal healthier, younger looking skin. This deep pore exfoliation scrub also contains minerals that trap impurities to be washed away while releasing moisturizing conditioners to soften and smooth the skin. It’s ah-mazing! No joke. I like to use the manual scrub before a special event so my makeup glides on like butter. Try it! Previous postBraids, BUNS, Top Knots, Fishtails- Oh MY! I love the Mia… Every woman should own one! My all time favorite product, I’m glad you are loving it! Hi Laura!!!! This site is so awesome! I have a question for you which is probably going to make you die! 😉 I only use water to clean my face and the occasional face wash and I am breaking out so bad all the time. Like you said, break outs at 30 is very frustrating! Could you give me any advice on what to use exactly? I have zero knowledge when it comes to face care. Crazy, huh? Thanks Laura! Miss u! OMG girl, I have no pulse! We definitely need to re-assess your current face cleansing routine. I’m going to send you an email and give you all the deets.